Super Hero Boy: Finally a Webkinz that's great for the preschool group! Finally a Webkinz that's great for the preschool group! We recently hosted a MommyParty hosted by Webkinz Jr and seeing as Connor has recently discovered not only how to turn on his daddy's computer but also how to access online games all by himself (I only wish I was making this up). I figured it's more than time for him to have his first online pet. I had to laugh though, my child and only my child, with giving him first pick of all the Webkinz Jr plush he had to pick the PINK elephant as his favorite one. No one can ever accuse Connor of not beating to his own drum. Actually he loves that pink elephant so much he sleeps with him quite often as well. At the party we let the rest of the kids get their animals based on a game we choose where I gave hints as to what animal was inside of two bags. The child that guessed right got to pick between the two animals as their new friend. 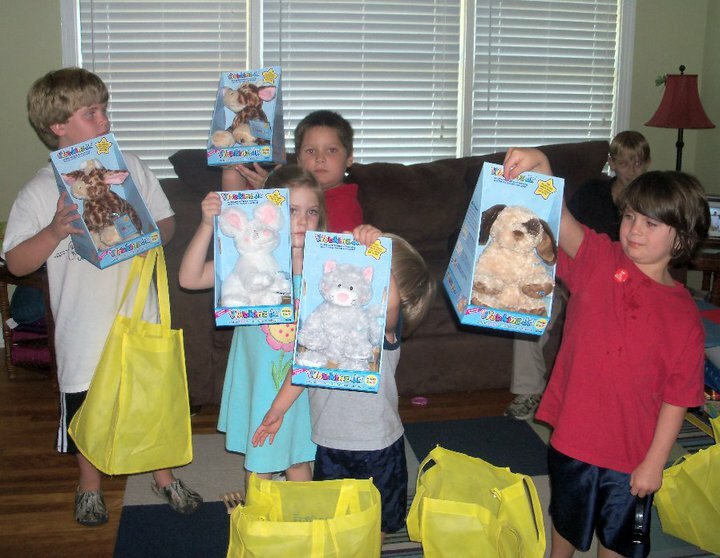 Everyone ended up happy with their choices and there was a little trading before it was all over but all our guests ended up going home with a new Webkinz Jr buddy of their very own. What I really love about Webkinz Jr though is the fact that Connor can log onto the website and play without me having to worry about what he is doing and though I always monitor his Internet usage it's really nice to have a site that I don't have to really be overly concerned about what he may be seeing or doing while he visits his online pet. The site is easy to use and no reading is required to fully enjoy all the features. Everything is laid out really simply and the controls are really easy to use even for a three year old. 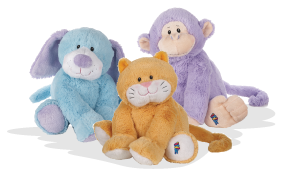 I have to say though even if your just looking for a great plush pet the Webkinz Jr are amazingly soft and cuddly and I actually really prefer them plush wise to the regular Webkinz as they just fee great. I'd buy one even if they did not include online tags as I honestly just really love the plush themselves. The dog especially is super super cute. Head on over to the Webkinz Jr website to see the entire selection of Webkinz Jr as well you can take an online tour before you go out and buy your own online pet! Those are some cute kids and Webkinz Jr is great! Thank you for having us and the boys love thier cat and dog! They ask everyday to get on Webkinz Jr website!